When you come to Israel for your gap year with Aardvark you will spend time in Ulpan (language school) and improve your Hebrew skills over the course of the year. However, to make you feel more at home from the beginning it is useful to know some Israeli slang. Of course, due to its inherent nature slang is continually evolving and changing but there are some expressions which seem unlikely to ever go away. 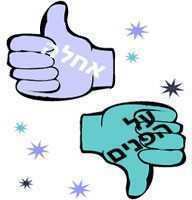 You will frequently here Israelis responding to a proposal or a piece of information with the word ‘Sababa’ (סבבה). Simply put this means great, cool, or no problem. If someone puts an idea to you and you like it simple say ‘Sababa’ and get on with the plan. A slightly odd expression which is used very frequently is ‘Le’echol Sratim’ (לאכול סרטים). Literally translated this means ‘to eat films/movies’ but it used to mean that someone is being overly dramatic and enjoys producing drama for no good reason. A good English equivalent is to call someone a drama queen but hopefully your gap year will be drama free. You will probably hear a number of situations being described as a ‘Balagan’ (בלגן) which means a chaotic mess, something which is common in Israel. However, if you put the word ‘Yalla’ (יאללה), which is slang for get a move on or lets go, in front of ‘Balagan’ (Yalla Balagan) then you are basically saying ‘great, let’s go for it, it’ll be great fun’. Films seem to come up quite regularly in Israeli slang as another common expression is ‘Chai B’Seret’ (חי בסרט) which literally means ‘lives in a film’. It is used to tell someone that they’re being completely unrealistic and can just dream on if they think that something is going to happen. Probably a useful phrase for when schemes become a bit too ambitious and ‘Yalla Balagan’ is no longer the appropriate response. In some parts of the world it has become common to use the word ‘like’ completely unnecessarily and frequently throughout a sentence. Unsurprisingly there is an Israeli equivalent, the word ‘K’iloo’ (כאילו) which is probably most accurately translated as ‘as if’ but is used in much the same way as the English ‘like’. Another slightly confusing slang expression that you are sure to hear a lot is ‘Chaval Al Ha’Zman’ (חבל על הזמן) which literally means ‘a waste of time’ however, in slang it is used to mean the complete opposite of that. If you ask someone how their night was and they respond with ‘Chaval Al Ha’Zman’ you can be sure that they had a great time and would love to repeat the experience. There are also numerous slang words for referring to people such as ‘Achi’ (אחי), ‘Gever’ (גבר), ‘Chabibi’ (חביבי), ‘Motek’ (מותק) and ‘Neshama’ (נשמה). Respectively these mean ‘Brother’, ‘Man’, ‘Dude’, ‘Sweetheart’ and ‘Soul’. It’s pretty obvious when it is appropriate to use each one and you are sure to pick it up in no time at all. Obviously this is just a small selection of Israeli slang but if you arrive in Israel familiar with the above words and phrases you are sure to feel right at home in no time at all.